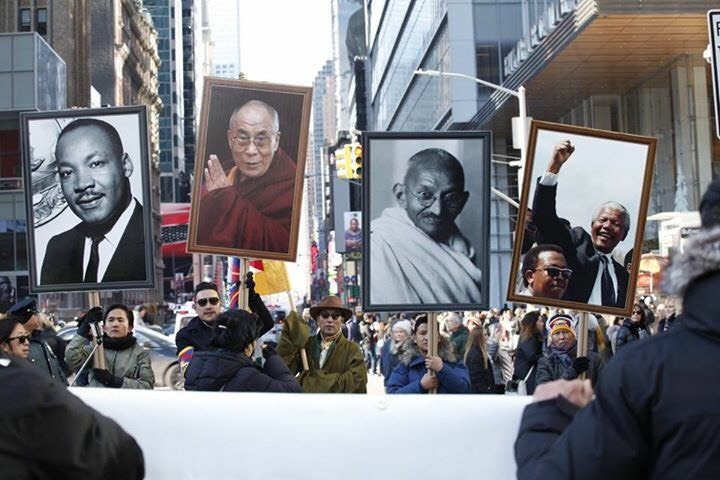 (TibetanReview.net, Dec12, 2017) – Thousands of Tibetans and supporters from across North America took part in a mass solidarity rally in front of the United Nations headquarters in New York City on Dec 10, the World Human Rights Day, to commemorate the 28th anniversary of the conferment of the Nobel Peace Prize on Tibet’s exiled spiritual leader, the Dalai Lama. The estimated 5000-strong ‘Solidarity With Tibet Rally For Peace and Nonviolence’ rally was addressed by President Lobsang Sangay of the Central Tibetan Administration (CTA) and Speaker Khenpo Sonam Tenphel of the Tibetan Parliament-in-Exile. Many Chinese scholars and dissidents, including Prof Ming Xia, Chinese activist Chen Guangchen, democracy activist Yang Jianli, attended the rally. The President appealed to the United Nations to protect the fundamental rights of the Tibetan people, referring to the ongoing protest self-immolations and enormous destruction of religious centres still taking place in Tibet. He said the issue of Tibet had worldwide ramifications. Speaker Khenpo Sonam Tenphel recalled the contributions of the Dalai Lama to the Tibetan people and to the world and also referred to the seriousness of the human rights situation in Tibet under Chinese rule. Guest speakers included Prof Raj Mohan Gandhi (a great-grandson of Mahatma Gandhi) and blind civil rights activist Mr Chen Guangcheng a ‘barefoot lawyer’ who had made a dramatic escape from his homeland some years back. It was a daylong rally which took off from the United Nations building, passed through the streets of New York City, and culminated in front of the Chinese consulate. Participants raised slogans about peace, human rights, non-violence, dialogue and the Dalai Lama, during the rally. More speeches were delivered before the Consulate by Chinese supporters. A section of rally participants carried more than 150 symbolic coffins draped in Tibetan flags for the Tibetans who had carried out protest self-immolations against Chinese rule in Tibet since Feb 2009. The rally was organised by a committee chaired by Ms Pema Chagzoetansg and Mr Tsewang Rigzin, the two members of the Tibetan Parliament in Exile representing Tibetans in North America, as a part of the ‘Year of Campaign’ declared by the CTA on Mar 10 this year.